Why electrical panel is so important and why do you need it? The electrical panel is an important part of an industry, but why is it so important? In electrical supply system, electrical panel is the main source that distributes electrical current to the various circuit. Electric panel transfers current from one circuit to another so that current which is provided to you reaches you in a protected way. It also divides electrical power in into subsidiary circuits. It also provides you with protection from hazardous accidents such as short circuit and fire accidents at your industry. It also protects your instruments used in your industry which need high power or electrical supply. It does this by supplying sufficient power supply needed for the instrument to work properly. Due to all these functions of electrical panel, these are used in large industrial areas. Electrical panel manufacturers like Vasudev power solution always make sure for the design and construction of electrical panel according to your and also does make sure that all these equipment are away from moisture, chemical and dust so that the electrical panel may work properly. Vasudev power solution design electrical panels such that it may not affect the nearby devices. One of the best advantages of electrical panel is that its maintenance is almost zero, which may help you and your device to function properly. You need to install an electrical panel with a help of a specialist or an expert so that your electrical panel may function properly and may help it from getting damaged. For all these problems Vasudev power solution come front to help you. They manufacture panels and also install it for you at your ease at your place. They also do the repairing work if required. Vasudev Power solution is the leading manufacturer of electrical panels. They deliver you the product with the best quality and at an affordable price. So what are you waiting for? If you are owning any kind of industry you require an electrical panel to solve all your power needs. If you are holding a huge industry which manufactures specific products, then you want someone to handle your factory or industry power supplies to be handled properly. So for all these solutions, Vasudev Power Solutions comes forward to solve all your power solutions problems. Vasudev Power Solutions is a leading power solution manufacturer in Jaipur. All types of electrical control panels are manufactured and supplied, along with the manufacture and supplies they also repair your existing power supply units or electrical control units. All these services can be found on their website at your ease so that your precious time and money can be saved. All the GSS installations process is being provided by Vasudev power solutions wherever you want. Vasudev Power Solution is said to be the one of the best and approved manufacturers, exporters, and suppliers of Electronic drive panels. Vasudev Power Solution provides the panels at the best price and the range of drive panels is highly appreciated in the whole country. Some examples of the electrical panels manufactured and supplied are distribution panel, Meter Panel, Motor Panel, GSS installation panel, Drive Panel etc. When you are buying a product you always want to make sure that product is of good quality or not, here you need not be worry as Vasudev Power Solutions has the best quality electrical panels and comes with guarantee as the electrical panels are tested properly before supplying to the customers, that’s why Vasudev Power Solutions is being trusted whole over India. Vasudev Power Solutions have served many happy faces and will be serving in future with all their support. So if you need any help or want to buy or want to repair your old electrical panels just visit their website you can find all their information’s supplied there at your ease. If you are holding a huge agricultural land or a huge industry where water is to be needed for production or for manufacturing units in a large amount, Motor control panel is used here to control the overflow of water. Motor control panel is used in agricultural or industrial applications which are designed to start, operate and control a single motor. The Motor control panel conform to the international standards and are available with multiple power stabs that help in supporting high capacity industrial motors. 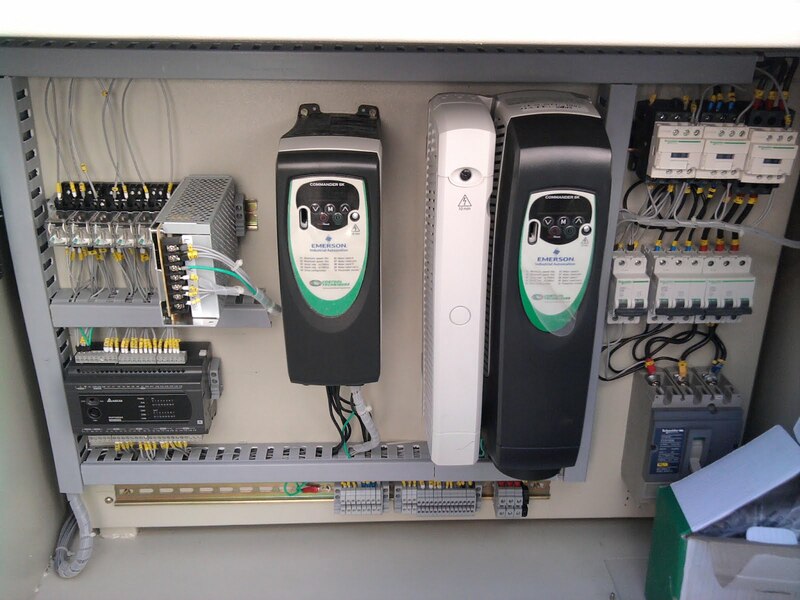 The motor control panel does the operation, Control, and protection of motor network with or without PLC/BMS Connectivity. Motor Control Panel system is 3 Phase, 3 or 4 wire, and 50Hz. 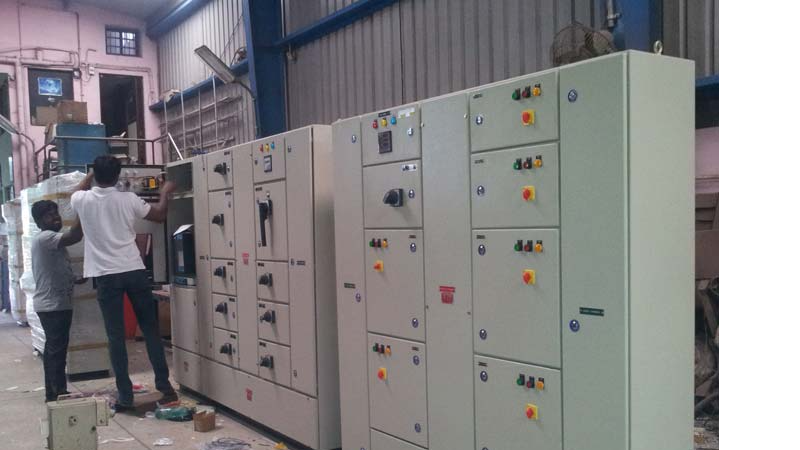 Vasudev Power Solution comes forward for manufacturing, supplying and repairing motor control panels in Jaipur. All these services can be found on their website at your ease so that your precious time and money can be saved. Vasudev Power Solutions is a leading service solution which will help you find the best according to your need. You can customize Motor control panel according to your need so that you are able to use control panels effectively. 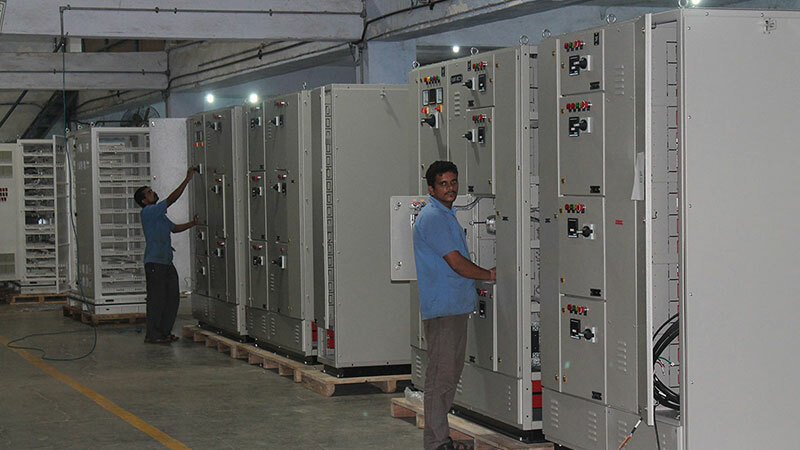 All type of installation process for the motor control panel is being provided by Vasudev Power Solution. And you need not worry about the motor control panel’s quality as these are the best quality product you can get at present market and before installing these all are tested. Best price for the Motor control Panel will be provided with all the technical details at the website. 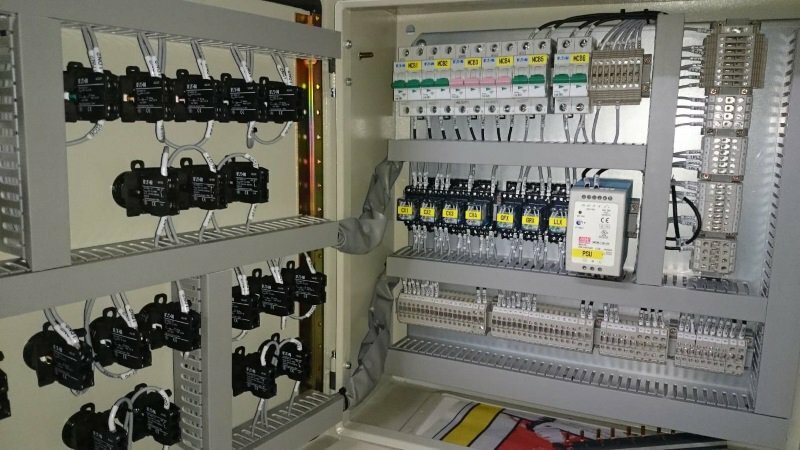 The Distribution panel or board consists of a basic frame with all the necessary electrical panel components such as main isolating switches, emergency shut-down mechanism, RCDs, line circuit breakers, controls and contractors for individual workgroups. The distributor can supply multiple workgroups with electrical power panel independently. We design & manufacture the Sub Distribution Panel according to the Customers’ need for reliability, selectivity, durability & time of taking action to Product Quality which complies with cost-effective, long life and application-wise. The cost is defined as Distribution Panel with Power Factor. As the maximum value of cos is 1, a maximum value of Distribution Panel with Power Factor would be 1. With low power factor, any electrical system draws more current for same power. Electrical authority imposes the penalty if power factor is less than a minimum standard. To improve power factor, capacitors need to install in ratio with power factor and load. If a capacitor is less/more than required, power factor becomes low. The Distribution Panel with Power Factor correction relay works automatically and senses the requisite power factor. Accordingly uses the exact quantity of capacitor in the circuit as per the power factor. What is a Meter Panel? Vasudev Power Solution is a digital Meter Panel Manufacturer in Jaipur. Meter Panel are instruments that display an input signal in an analog or digital Meter Panel company. Many Meter Panel also include alarm options as well as the ability to transfer data to a computer. Meter Panel take a sample of the voltage or current to create a visual representation of the measured value. Voltage measurements are read across the line, while current measurements are taken in series with the load, sometimes utilizing shunts or current transformers when the load current exceeds 10 amps.verload protection device. When used in such applications, they are often referred to as MCPs (Motor Circuit Protectors). In analog Meter Panel, the interface is application specific and can display any unit of measure, with nearly any input signal that is representative of the process. An analog Meter Panel can display speed, frequency, Voltage, current, temperature, strokes per minute, or feet per second. The actual input signals are the analog voltage or current, in either AC or DC. For example is 0 to 10 volts DC, four to 20 milliamps DC or 0 to 100 volts DC. Digital Meter Panel operate in much the same way, however, digital Meter Panel will often-times also include digital scaling of the display relative to the input signal. Analog Meter Panel has two methods for displaying readings. The first is a taut band that has the needle suspended between two ribbons of metal and is ideal for environments prone to high shocks. The other system is a pivot and jewel, where the pointer has more stability for higher vibration environments. Amongst the different types of Meter Panel, the digital Meter Panel offer the greatest resolution. This is often confused with accuracy, but analog meters can be just as accurate as a digital Meter Panel. Digital Meter Panel offers an easier to read display, especially in low light, also providing greater resolution. The readings can be the same between an analog and digital Meter Panels, but in the cases where the input signal constantly changes, the analog meter panel may be preferable. Using a motor as an example, the Meter Panel could be wired with a shunt or CT to see how many amps a motor is drawing at any given time. To be sure that the motor control panel is drawing close to 20 amps, an analog meter can give a good visual indication of how many amps are being drawn. With an increase or decrease in torque, the needle will fluctuate within the range on the display. As for the digital Meter Panel, the constant changing of numbers makes it more difficult to read. This, of course, is not true for all applications. With the digital Meter Panel, the display is much easier to see at a glance than an analog meter. Digital Meter Panel can also offer greater functionality. A Digital Meter Panel can be reconfigured to display volts, amps, temperature or any other engineering unit. Relay outputs are sometimes available, allowing the meter to control a process based on the measured input signal or display value. Vasudev Power Solution Manufacturer are pleased to introduce ourselves as one of the best and approved manufacturers, exporters, and suppliers of Electronic drive panels. We also offer services for Automation & Control accessories. All Type Electric Control Panel & Repairs, HTLT Panel & Cabling Works, HT GSS installation, Meter Panel, DG Panel, Heater panel, APFC Panel, Drive Panel, Motor Control Panel, Fire Control Panel, Earthing & Lighting Easter Work. We Deal With Old & New HT LT Switchgears & DG Sets. The supplied voltage range is between 11KV to 132KV. This power distribution panel has many features which are very useful like Redundant Power Inputs, SNMP Support, Alarm Monitoring Option and Industrial-Grade Durability. An equipment always needs a backup power source so we added the feature of dual power input. If one input loses the power other input can be used and your equipment can still be monitored by a backup power source. If the device has any problem regarding anything we will receive an alert and you can take the instant reaction to the problem with the support of SNMP. With the feature of alarm monitoring remote, you will be able to achieve maximum visibility and control of your remote sites. Motor Control Panel is designed to start, operate and control a single motor for use in an agricultural, commercial and industrial application, where very dusty or corrosive processes are used. This Panel is manufactured under the supervision of our team of qualified professional engineers. The offered range of panels is manufactured using high-grade raw material and other material like Full voltage non-reversing and reversing starters, AC variable frequency drives, PLC I/O chassis, Solid-state motor controllers, Lighting Panels, Transformers, Analog or digital metering, Feeder breakers, Feeder fusible disconnects and etc. GSS installation Panel is manufactured to maintain a power transmission network. It is assembled with the best electrical component including Power Transformers, Circuit Breakers, Rectifier, Current Transformers, Potential Transformers, Busbars, Switchgear, Surge arrestors, Line trap, Earthing Transformers, Auto-Recloser, Overhead earth wire, underground earthing system and others items. We use isolator also for open an electrical path. Drive panel is an AC motor controller which is used in many areas like CNG machine tools, Extrusion, Cranes, Textile, Printing dyeing, Chemical fibers, Papermaking, Wire drawing, Manipulator, Solid warehouse, Oxygen making a machine, Air compressor, Ceramic machine, Industrial washing machine and others. We designed drive panel with some components which are 6 Programmable Digital Inputs, V/Hz and Sensorless Vector Control, 230V, 2 Isolated Analog Inputs, 2 Programmable Relay Outputs, 460V and 575V Input Voltage, 110% Overload 1 min. A meter panel is a device that displays input signals in analog or digital form. Meter Panels are manufactured to measure the voltage and current of the system. We use advanced technology in meter panel which gives you effective performance, accurate dimensions. You can easily install in residential as well as commercial building. It is ideal for industrial and test applications. Automatic Distribution with power factor panel manufacturers in Jaipur, Rajasthan and you can buy Automatic Power Factor Panel in Jaipur and check the price. We follow quality processes and we are ISO 9001-2008 Certified Company.